Here at The Shepherd Centre, we recently had the pleasure of a visit from the CEO of Auditory Verbal UK – a small charity based in London and Oxfordshire working with young children with hearing loss, their families and industry professionals. Anita visited Australia to see how First Voice centres like The Shepherd Centre were delivering auditory-verbal therapy programs and to learn from their experience of working with families for such an extensive period. “I was awarded the Macquarie Group David Clarke Social Innovation Fellowship which enabled me to visit centres across Australia and New Zealand this year,” said Anita. Anita visited Brisbane, Canberra, Wollongong and Auckland in New Zealand as well as four of The Shepherd Centre’s locations: Newtown, Wollongong, Macquarie and Canberra. She also paid a visit to Cochlear Limited at Macquarie University and attended the Power of Speech event at Parliament House in Canberra in August. “Attending Power of Speech was an absolute highlight,” commented Anita. “Seeing the fantastic children challenging perceptions of children with hearing loss was just amazing,” Anita said the trip, in general, proved to be invaluable. Anita also was impressed by the different fundraising techniques and communication campaigns run by The Shepherd Centre. “We are very excited that we will introducing Loud Shirt Day to the UK next year,” said Anita. “There are lots of great examples of fundraising and communications materials that have worked well for families along with outlines of programs and support for children at key stages of their lives. It was also interesting to look at the different systems information tools that have enabled the organisation to work effectively. We can learn from these and apply similar concepts in the UK as we grow bigger. Cochlear implantation is happening earlier through The Shepherd Centre’s First Sounds Implant Program. The centres in Australia receive federal and state government funding to provide audiology and therapy programs for children. This means they are able to provide services at no cost to families because of the work that has been done to secure government funding and a successful fundraising program built up over a number of years. There is a considerable amount of telepractice taking place in Australia through The Shepherd Centre which is interesting especially given the size of the country and location of some of the families. The Shepherd Centre introduces new families to the program using incredible support from family counsellors. The degree of integration between audiology and habilitation support at The Shepherd Centre – we are working to establish in the UK at our centres and encouraging closer collaboration between professionals working in our National Health Service. The Shepherd Centre collates, analyses and reports on data – including standardised assessment protocols across the First Voice Network. 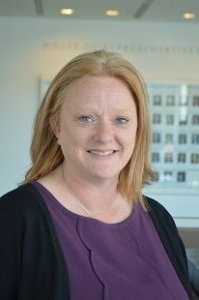 Anita’s colleague Rosie Quayle, Clinical Lead at Auditory Verbal UK will also visit The Shepherd Centre this month thanks to a Winston Churchill fellowship.